As Yoga Sutra 1. 1 says – And NOW the teaching of yoga begins. The teachings of yoga call this ishvara pranidhana, or surrendering to something greater than ourselves. Coming from a background of abuse and other intense life experiences, like being mugged in South America, India had a lot of unresolved trauma that she needed to work through. During her Yoga Therapy program and the years to follow while teaching and continuing to practice and learn, the level of healing she experienced was transformational, and it positively changed her overall health, her relationship with herself and others, and her quality of life. 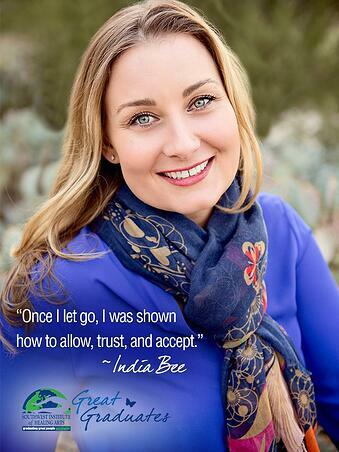 India launched her own company, India Bee Yoga, LLC in December of 2012 because she strongly feels that there is a lot of work to do, and she is ready to serve. When she was in corporate America, she saw first-hand how debilitating the competitive business world was on herself and her colleagues; she witnessed the devastating ripple effect it had on the bottom line of businesses and health care costs, and then there was the rise of pharmaceutical drugs to treat the widespread depression, anxiety, and apathy. It was this experience that fueled her drive to contribute to a more sustainable and healthy world. In hindsight, if she had chosen to enter the yoga field before corporate, she never would’ve had the experience of seeing the devastating condition millions of her fellow Americans are in; what a blessing it turned out to be, that she “didn’t know” what to do with yoga after her experience in Bolivia. Her heart and soul knew, perhaps her brain was late to the party. Yoga is a catalyst that allows you to tap into the depths of soul-knowing, and in that peace and stillness, grants us access to hear its whispers. A message India frequently shares with students is that this practice is not something to be achieved, rather it is something to be received. 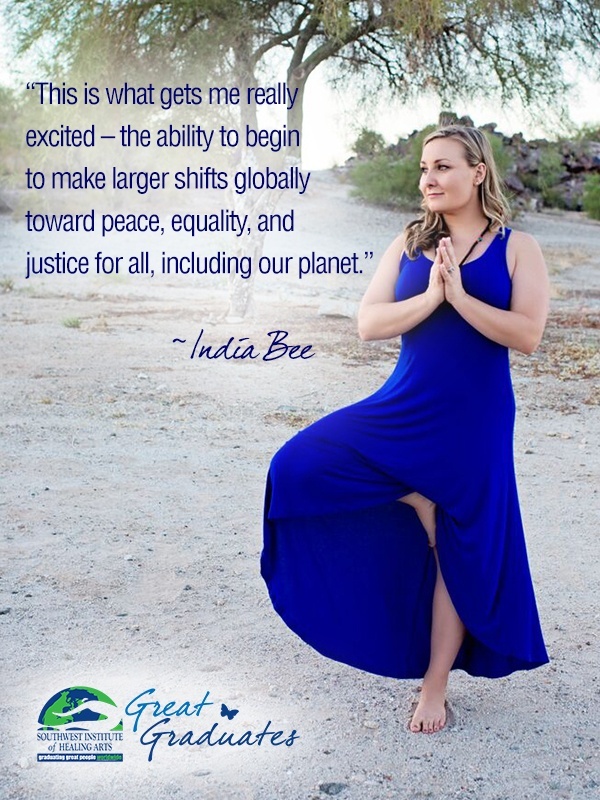 Today, she is privileged to be a regional leader for Off The Mat, Into The World and has the honor to collaborate with her partners in facilitating small group leadership trainings called ‘Yoga In Action’, which aim to create community around yoga and service through deep self-inquiry and leads to action within communities and the world. 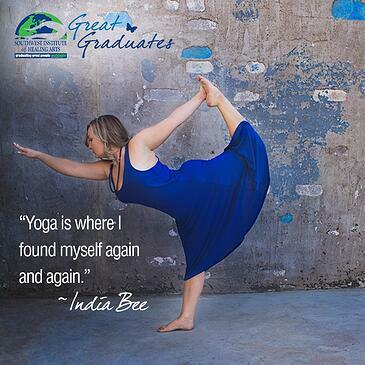 India Bee Yoga has a strong commitment to giving back and what she feels most passionate about is the environment. 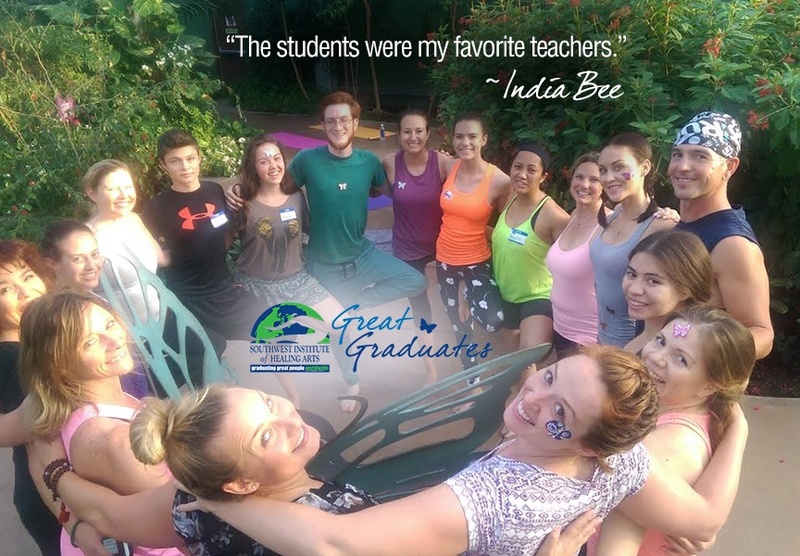 You can find her teaching weekly “Yoga in the Rainforest” classes which are held inside the atrium at Butterfly Wonderland, located in Scottsdale, AZ, where she has the privilege to practice yoga together with students in a tropical setting amongst thousands of butterflies! The proceeds from those yoga classes go directly to the Butterfly Wonderland Foundation which is doing wonderful work, including educating children and adults about the importance of our pollinators and rainforests. Did you know that 1/5 of the oxygen we breathe comes from the Amazon Rainforest? That’s every fifth breath we take! India considers herself a “tree hugger” for life. In addition, she has a small home studio called Studio Bee where she sees clients for yoga practice, yoga nidra, and gong meditations, and she travels to corporations that value mindfulness practices as part of their benefits to employees. Travel is also a passion of her’s and she feels that travel has opened her eyes and her mind in ways nothing else can, so she has partnered with a long-established, high-level tour company to offer yoga + travel experiences. India’s practice of yoga is to stay in the present moment, however, as an entrepreneur and business owner, it is important to plan ahead and she is continually looking for ways in which to expand and grow her business. Her suggestion for other entrepreneurs is to stay in the present moment, and have at least a year in advance planned out in terms of your business and action plan. Collaboration over competition is a deeply held belief for this graduate, and she feels blessed to share the upcoming events that she and her partners will be offering. Check out Spirit of Yoga's Electives and Yoga Courses below. Kerry Burki is Editor of the newly launched KERRY Magazine ~ a magazine that uses real women as models, supports small businesses, encourages you to feel beautiful as you are right now and even has a printable worksheet to help you go after your dreams! She been teaching yoga since 2004, currently teaches yoga + meditation at a local assisted-living facility near her home in Scottsdale, Arizona. 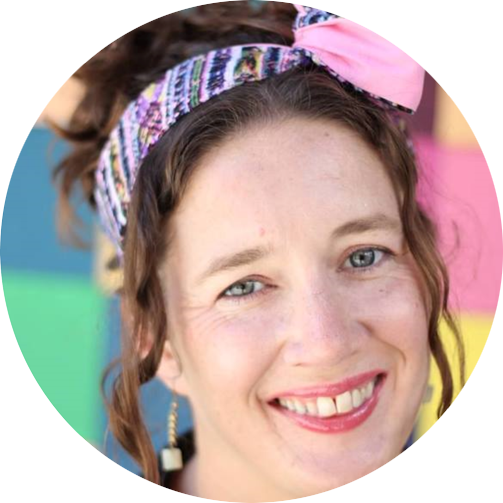 Kerry has written two ebooks about self-care (one for everyday and one for creatives) and she has just joined the SWIHA Success Center Team part-time as a blogger, consultant and creator!